Dr. Besma Al Najdi has obtained her MBBCh and her Diploma in Obstetrics and Gynaecology from Al Mustansirya Medical College, Baghdad, Iraq. She also obtained her Diploma in Obstetrics and Women Health from Royal College of Physicians, Ireland in 2002 and her MRCOG from the UK, in 2004. Dr. Besma has over 25 years of experience in the field of Obstetrics and Gynaecology. She has attended many conferences, courses and workshops. In addition, she is a member of the Royal College of Obstetricians and Gynaecologists in the UK. She has worked throughout Ireland and the UK as a Senior SPR specialist in Obstetrics and Gynaecology for the last 15 years. 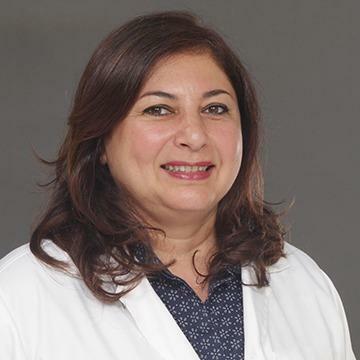 Her special areas of expertise are high risk obstetrics, major and minor gynaecological problems including post-menopausal women’s health and urogynaecology. Dr. Besma speaks Arabic, English and Spanish.